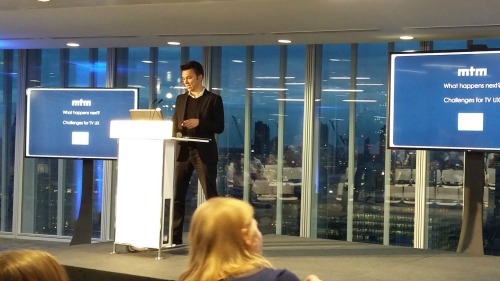 This months UXPA meeting was held on the 17th floor of the News UK building. 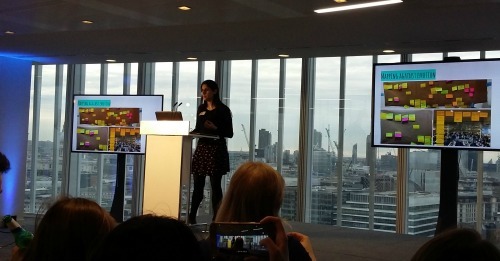 So with amazing views across London we listened to 4 speakers talk about their thoughts or experiences of UX in news media. I have to be honest here and admit that news media does not interest me that much. I do not read the papers or watch much TV, however I still found this an interesting event and there was still plenty that was relevant. First up was Jane Austin and Mel Hambersoonian from The Telegraph. They focused their talk on the work they have been doing behind the scenes. As a UX designer I know you should be designing for the users, the customer. But sometimes people forget that people within the organisation can be a user too. Jane and Mel have just spent the last 18 months redesigning the authoring tool which journalists use to put stories up on their website. Before they started it could take an hour to get a story up (that is not including writing it), but now it is more like 5 mins. Mel gave a really interesting overview of their process including 'open days' where they set up on the news floor and invited journalists to come and try out their designs. My key take aways from this talk was the fact you should remember to find out how your user feels not just what they do, and that within your team there should be real trust so you can debate and challenge ideas and designs to get the best result. 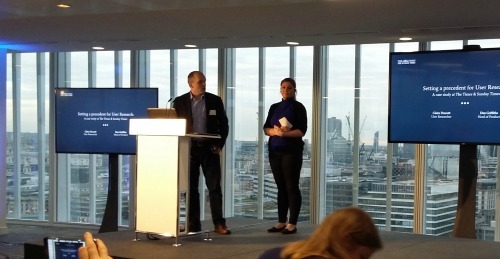 Next up were Dan Griffiths and Claire Dracott from The Times and Sunday Times. They talked about how they introduced user research and testing into their process, something which had been ignored before. They started off working with IDEO to do research with real users. Here they found that users like having editions with a start and an end. They liked the feeling of completion and that they had all the knowledge to start the day. But the team were also working in an environment which did not understand why things like research and design took so long, after all they can produce a newspaper in a day. It was really interesting to hear about how they carried out a diary study too and the work involved in that. My key take aways from Claire were about what to do after, in this case how to communicate the research that is being done and the results once it is complete, and how important prioritising recommendations is. 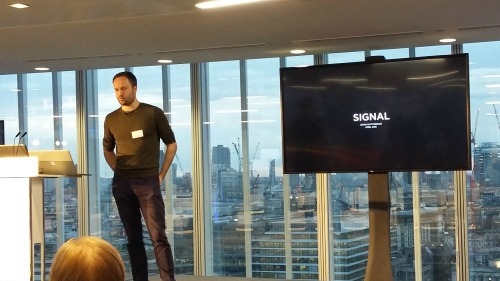 We then had Adam Hutchinson from Signal Media explain what they do, why and what UX is like in a start up. There are hundreds of thousands of stories, articles and blog posts written about companys every day and for some professionals, for instance in PR and Comms or investment, it is really important you can find all the relevant information. There is big fear for these professionals of missing something, so Adams platform needs to be not just easy to use but reliable, turning that fear into confidence. Having worked in much larger companies before this he found working in a start up a bit different. He found there was a lot more doing and less talking about process. He also found that UX is more a skill set than a role, meaning that multiple people across the company do it. But the thing I found most interesting was the idea that these professionals actually can tell you what they need if you ask, but will be harder to be convince them about the stuff they did not know they did not know. Last up was Jon Watts from MTM. As he said straight away they help companies understand and respond to digital change. They do not do UX. He was here to speak to us about the future of TV over the next 5 years. As he said people love their tellys, and although there is lots of competition, TV still accounts for 2/3 of all viewing. It just might not be live. The companys behind TV face many challenges starting with a real problem with the diversity of the tech used and the people watching, never mind the challenge of mixed business models. There were two points which really interested me. 1. How do you personalise a TV which might be viewed by many people? After all what the kids watch after school is very different from what mum and dad watch once the kids are in bed. And 2. someone in the audience asked about the risk of losing local TV when things like Netflix go global, but as Jon said, for many people the content of American TV shows just is not relevant to them. Domestic shows will continue to win for now. It was a really interesting evening with some great speakers, and some very interesting points to take away.